Analysis: Trump’s peace plan: the ultimate deal? President Trump’s long-awaited Middle East plan is close to completion, according to reports in the US media last weekend. The timing of its release is not yet confirmed and details of its contents are highly guarded. However, the president’s enthusiasm for negotiating the “ultimate deal” – a peace agreement which brings an end to the Israeli-Palestinian conflict – seemingly remains undimmed and a detailed blueprint is expected soon. In a hint at what may be coming down the tracks, senior Trump administration officials told the New York Times on Sunday that the plan will avoid setting out guiding principles – such as endorsing a two-state solution. However, they suggested instead that it will offer practical steps to solve the main issues – borders, security, the status of Jerusalem and refugees – which divide the two sides and upon which previous negotiations have floundered. They also indicated that there will be proposals that will please – and upset – both Israel and the Palestinians. This method defies previous peace-making efforts. Initiatives such as those launched by former US administrations, as well as the 2002 Arab Peace Initiative, focused on high-level principles and encouraged the two parties to negotiate the details underpinning them. One aide indicated that the Trump plan was akin to Waze, Israeli-developed technology which allows drivers to avoid traffic jams. Israeli media reports in January indicated that President Abbas was informed of the key parameters of Trump’s plan by Saudi Arabia, which has been kept closely in touch by Washington. The plan – dubbed “state-minus” – included provisions such as less-than-full statehood for the Palestinians, ongoing Israeli control over security matters, a permanent IDF presence in the Jordan Valley, land swaps not based on the pre-1967 lines, no settlement evacuations, and an Israeli veto regarding the final status of Jerusalem, which would be later negotiated by the parties. While the Palestinians would not be required to recognise Israel as a Jewish state, they would have to give up the right of return. Further details of ideas around land swaps considered by the Americans have appeared in Arab media outlets. One, based on a 15 year-old Israeli plan, involves extensive territorial exchanges, with Egypt ceding territory in Sinai to the Palestinians in order to expand Gaza southwards along the shore, making it three or four times its present size. This expansion of Palestinian territory would allow Israel to annex the West Bank settlement blocs. Israel would, in turn, hand Egypt land along the two countries’ southern border. The veteran Palestinian negotiation, Saeb Erekat, is also reported to have compiled a document on what may be in Trump’s plan based on conversations with sources, particularly in those Arab states, such as Saudi Arabia and the United Arab Emirates, which have been advising and working with the US. Erekat is said to have calculated that land swaps would see the Palestinians lose 10 per cent of the West Bank to Israel. Previous plans involved much smaller swaps: that advanced by Bill Clinton in 2000 and Israeli prime minister Ehud Olmert in 2009 worked on the basis of six per cent, while the 2003 Geneva Initiative envisaged 4.5 per cent. Crucially, these swaps involved an equal exchange of territory between Israel and the Palestinians. It is thought that a figure as high as 10 per cent would involve a net loss of Palestinian land. Trump has also previously hinted that in return for him having “taken Jerusalem … off the table” by his December decision to formally recognise Jerusalem as the capital of the Jewish state, Israel would have to “pay more”. It has been rumoured that this may involve the transfer of Palestinian neighbourhoods in East Jerusalem to the Palestinian Authority. The Trump plan is thus said to refer to a Palestinian capital in the “Jerusalem neighbourhoods” or “Jerusalem suburbs”. Abbas is believed to have bitterly complained that the Americans were planning to foist Abu Dis – a Palestinian village outside of the Jerusalem municipality – on him as a capital city. Both Palestinians and Israelis are likely to benefit from the changed regional dynamics any deal might bring. Israel would be able to establish open relations with Saudi Arabia. The Saudis would also pour large sums into the Palestinian territory, while Jordan would provide Ramallah with mentoring and diplomatic backing. At present, the most challenging problem is the ongoing fallout following Trump’s Jerusalem decision and his more recent announcement that a new US embassy will open there in May. The move infuriated Abbas, who responded by suspending contacts with the US and declaring that it no longer sees the Americans as honest brokers who can oversee the process. The PLO also threatened to end its 30-year-old recognition of Israel and end the PA’s security cooperation with it. Relations between the PA and the US remain so strained that Abbas this week refused to sanction Palestinian involvement in a White House summit designed to address the problems of Gaza. While Trump’s initial declaration was more nuanced than some suggested at the time – his speech explicitly stated that the US was “not taking a position [on] any final status issues, including the specific boundaries of the Israeli sovereignty in Jerusalem, or the resolution of contested boundaries” – the president’s later claim that he had “taken Jerusalem off the table” and his subsequent threats to cut aid to UNRWA and the PA further angered the Palestinians. Abbas has thus ramped up efforts to “internationalise” the conflict – long his preferred strategy – with attempts to persuade other countries, especially in Europe, to become more active participants in any future peace process. The PA wishes them to become more deeply involved in negotiations by perhaps adopting a model such as the P5+1 set-up which oversaw the Iran nuclear deal, as well persuading countries to unilaterally recognise a Palestinian state and support full Palestinian membership of the UN. But Trump’s Jerusalem decision also provided Abbas with a convenient get-out. 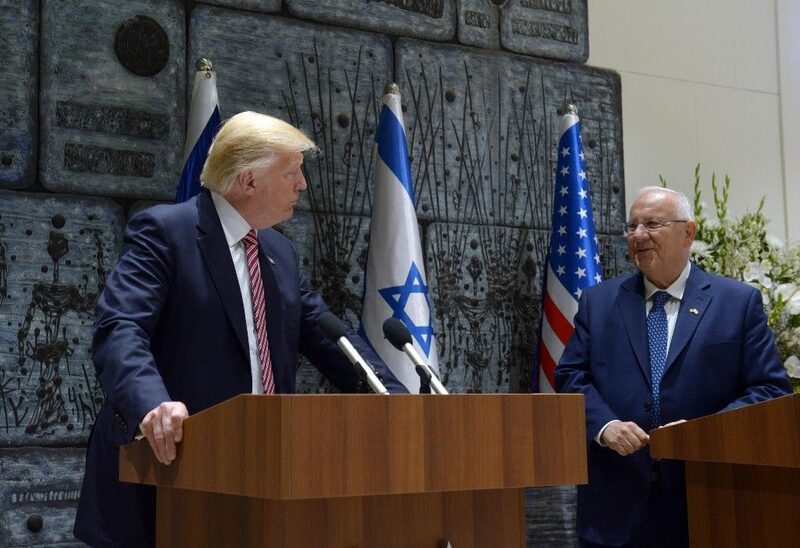 Despite the president’s recent claims that “the Palestinians … are wanting to come back to the table very badly”, some analysts suspect that this is not, in fact, the case. Michael Herzog, a senior visiting fellow at BICOM, argues that Abbas “was afraid of the US plan coming his way, felt he would have to reject it – while Israel accepted it – and didn’t want to navigate that situation”. Abbas’ weak political situation domestically – 77 percent of Palestinians want him to resign and 70 percent believe the PA is corrupt – and the failure of the reconciliation deal with Hamas to bring about a disarming of the terror group and full PA control over Gaza means that he is unlikely to have wished to spend any of his depleted political capital on the compromises a US-brokered deal may have involved. Indeed, it was telling that moderate Arab states – sensing this potential shift in dynamics and keen to continue their low-key détente with Israel – adopted a markedly restrained response to the Jerusalem announcement. Beset by the threat of indictment, and with the possibility of early elections, Israeli prime minister Benjamin Netanyahu may also lack the necessary room for political manoeuvre should he wish to make concessions to the Palestinians. His current coalition leaves him heavily dependent on partners, such as the hard right Jewish Home party, which are deeply opposed to a Palestinian state. Both Jerusalem and Ramallah also face the challenge of declining public backing for a two-state solution. Nonetheless, as recent polling has shown, imaginative thinking around such issues as security cooperation and compensating refugees could boost considerably popular support among both Israelis and Palestinians. Few, though, would be confident that the Trump administration has the surety of touch to broker such a deal.